Pope appeals for Alfie Evans and Vincent Lambert Pope Francis met with the father of seriously ill British toddler Alfie Evans in the Vatican before making an appeal in which he reiterated his call to safeguard the lives of Alfie and of Vincent Lambert. Speaking during the General Audience on Wednesday, the Pope said he wanted to highlight their plights and remind us that “it is our duty to do all that is possible to safeguard life”. “Let us gather in silence and pray so that the lives of all persons, especially of these two brothers of ours, are respected” he said. 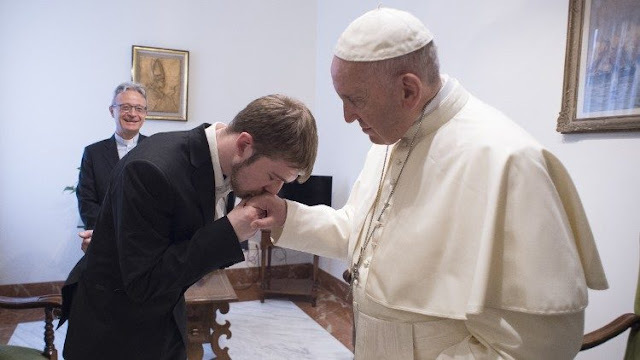 Pope Francis had asked for prayers for Vincent Lambert, a severely brain-damaged man in France, and for Alfie Evans, a British infant with an undiagnosed degenerative disease, during his Regina Coeli address on Sunday. Both patients are on life support and their families are fighting legal battles to ensure they continue to receive necessary basic medical care. During that appeal Francis asked that everyone pray for "people, such as Vincent Lambert in France, little Alfie Evans in England, and others in different countries, who have been living, sometimes for a long time, in a condition of serious infirmity, (and are) medically assisted for their basic needs." These "delicate situations," he said, are "very painful and complex. Let us pray that every sick person may always be respected in their dignity and cared for in an appropriate way for their condition, with the unanimous contribution of family members, doctors and other health-care workers, and with great respect for life." Before the Audience on Wednesday morning Pope Francis met with Alfie Evans’ father in the Vatican.